A magnificent and highly specified beachfront villa of sumptuous modern design. Child-friendly with kids pool, and beautiful sunset sea views. Amenities satellite LCD TVs, DVD players, iPod docks, WiFi broadband internet, air-con bedrooms, fully equipped kitchen, BBQ, kids' pool, air-con gym, Jacuzzi, sea kayaks. Baan Asan is a magnificent beachfront villa located on the sunset-facing west coast beach of Taling Ngam, and overlooking spectacular sea views of The Five Islands. Architecturally modern, Baan Asan is intelligently designed and well specified, offering a sumptuous beachfront lifestyle experience. While sophisticated, chic, and extremely luxurious, Baan Asan is child-friendly, with kids’ bedrooms, and a children’s pool. Set on an idyllic white sand beach in a tranquil and secluded locale, this standalone luxury villa is securely situated within a walled garden for total privacy. Designed around the sea views, and maximizing on the beachfront experience, Baan Asan comprises 5 main buildings, all of which face views of the sea and the vast centerpiece swimming pool. The 20 metre infinity-edge pool overflows into a dedicated kid’s pool at the far end, and features an integrated Jacuzzi extension. The pool is surrounded by grass lawn, with modern sun-loungers and parasols on raised platform decks at the poolside. The lawn extends to the beach, where a sala pavilion provides a shady refuge for lounging on built-in sofas. On either side of the swimming pool are two bedroom suites in detached pavilions for complete privacy. Each of the 4 air-conditioned poolside bedroom suites features a private lounge area with a sofa and a private sun deck with loungers. The King-size beds are slightly elevated from the lounge areas, on wooden floors. The poolside bedroom suites also include large wall-mounted satellite LCD TVs, with DVD/CD, built-in wardrobes, safes, mini-bars, and private dressing rooms. The luxurious en-suite bathrooms feature twin vanities, walk-in rain showers, and sunken terrazzo tubs. Two of the bedroom suites include adjacent children’s bedrooms with bunk beds, and en-suite shower rooms. The kids’ bedrooms can be accessed via the main bedroom suites, or independently from the garden. To the rear of the swimming pool is the huge main villa, with open stairways leading up on either side of a water feature, to an elevated spacious verandah that runs the width of the building. Slide-away floor-to-ceiling glass walls open onto the immense open-plan living room, which features a high vaulted ceiling, with an array of suspended fans, and elegant charcoal terrazzo flooring. Baan Asan’s living room includes a lounge with an array of designer furniture, and a dining table seating 10. At the rear of the living room is a fully-equipped Western kitchen with espresso machine, with an adjacent Thai kitchen for unobtrusive staff catering. A guest bathroom and separate air-conditioned TV lounge with satellite LCD TV/DVD are also located to the rear of the living room, near the main entrance. A design feature of the living room is the floating staircase that leads to the mezzanine floor above. On this mezzanine level, which also features sea views through the high glass wall of the living room, is a fully-equipped air-conditioned gym. The gym is glass-fronted, and includes an adjacent shower room. A walkway leads across to a quiet office and library for catching up on work. On the third level of the main villa is the opulent master bedroom suite, which extends over the entire floor. The vast master suite opens onto a large balcony with phenomenal sea views, and includes a King-size bed, dressing room, a private TV lounge with LCD TV/DVD, a fitted kitchen, and a gorgeous en-suite bathroom with a large tub, double walk-in rain shower, and twin sinks. Baan Asan is fitted with state-of-the-art technology throughout, including a mood-lighting system, high-end sound system accessible from numerous zones around the property, large screen LCD satellite TV/DVD systems in all bedrooms, and complimentary broadband WiFi internet access. The villa includes a CCTV security system to supplement the night security guard, and staff are always on hand to attend to your every need. Baan Asan includes a full-time Thai chef, manager, and maid, who will cater to your every whim. 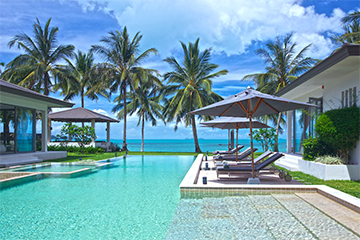 An ideal beach holiday experience for friends or families alike, Baan Asan offers the latest in creature comforts and luxury, with absolute comfort and privacy for parties of up to 10 adults and 4 children. Located on the West coast of Koh Samui, 15 minutes from the ferry port of Nathon and Lamai, and 35 kms from Samui’s international airport. Santiburi Championship golf course is 25 minutes drive away. 5+2* bedroom sleeps up to 10+4 children. 4**+2* bedroom sleeps up to 8+4 children. *Kids bedrooms, each with 2 bunk beds. -Rates are inclusive of continental breakfast, in-villa chef service and airport transfers, one trip each way. 15% discount for bookings made at least 120 days in advance, except for CNY and Easter, when 5% discount applies to bookings made 150 days in advance. Applicable to full occupancy rates only, and cannot be used in conjunction with other promotions. Not applicable to Xmas/NY.